(a) Using a 5 mm hexagon wrench, remove the 3 nuts. (b) Disconnect the 2 clips, and remove the cover. (a) Remove the 2 bolts, 2 nuts and adjusting bar. (a) Remove the 4 bolts and control rod. (a) Remove the bolt, mounting stay No. 2 RH and mounting bracket No. 2 RH. (a) Remove the bolt, nut and adjusting bar bracket. (b) Remove the 3 bolts and disconnect the compressor. HINT: Hang up the hoses instead of detaching them. (a) Remove the vacuum hose for the brake booster. (b) Disconnect the connector from the tube while pinching part A with fingers as shown in the illustration. Check for contamination in the pipe and around the connector. Clean if necessary and then disconnect the connector. Disconnect the connector with your hands. If the pipe and connector are stuck together, push and pull the connector until it comes free. Put the pipe and connector ends in vinyl bags to prevent damage and contamination. (a) Disconnect the engine wire from the ECM and junction block. (b) Disconnect the engine wire from the engine room junction block. Remove the nut and separate the wire harness. Using a screwdriver, release the engine room junction block. Disconnect the engine wire by pulling it upward. (c) Remove the 2 nuts and pull out the engine wire. (d) Remove the body ground. (a) Using a 6 mm socket hexagon wrench, hold the ball stud. (b) Remove the nut and disconnect the stabilizer link. (a) Using SST and a hammer, strike the lock nut covering to remove it. Set the drive shaft's groove so that it faces up. Then use the SST and hammer. Remove the covering from the lock nut completely or the screw of the drive shaft may be damaged. Do not sharpen the tip of the SST. (b) Using a 30 mm socket wrench, remove the lock nut. (a) Remove the bolt and disconnect the speed sensor from the steering knuckle. NOTICE: Keep the speed sensor tip and connection free from foreign matter. NOTICE: Do not damage the dust cover of the ball joint. (a) Remove the bolt and 2 nuts, and separate the front suspension arm from the lower ball joint. (b) Using a plastic hammer, disconnect the drive shaft from the axle hub. SST 09213-54015 (91651-60855), 09330-00021 (b) Remove the 2 bolts and flywheel housing under cover. (c) Remove the 6 torque converter setting bolts. (a) Loosen the sliding yoke bolt. (b) Place matchmarks on the steering intermediate shaft and control valve shaft. (c) Remove the bolt and disconnect the steering intermediate shaft. (d) To prevent the steering wheel from rotating, fix the wheel with the seat belt. NOTICE: If the steering wheel is not fixed, the spiral cable will be damaged. (a) Set the engine lifter. (b) Remove the 6 bolts, 2 nuts, and frame side rail plate subassembly LH and RH. (c) Remove the 6 bolts, 2 nuts, and front suspension member brace rear LH and RH. (d) Carefully, remove the engine assembly from the vehicle. 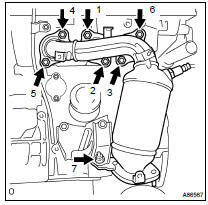 (e) Install the engine hanger as shown in the illustration. (a) Disconnect the A/F sensor connector. (b) Remove the 3 bolts and insulator. (c) Uniformly loosen and remove the 6 nuts in the sequence shown in the illustration. 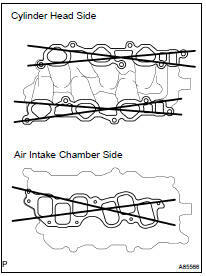 (d) Remove the manifold and gasket. (a) Using a precision straight edge and feeler gauge, measure the surface contacting the cylinder head for warpage. If the warpage is greater than the maximum, replace the manifold. (a) Remove the power steering oil pressure sensor harness. (b) Remove the pressure feed tube clamp. (c) Remove the 2 bolts and vane pump. (a) Remove the 2 nuts and disconnect the engine mounting insulator RH and LH. (b) Remove the nut and disconnect the engine mounting insulator FR. (c) Remove the 2 bolts and disconnect the engine mounting insulator RR. (a) Disconnect the 2 VSV connectors. (c) Disconnect the fuel vapor feed hose No. 1. (d) Disconnect the fuel vapor feed hose No. 2. (e) Disconnect the 2 vacuum hoses. (g) Remove the 2 nuts and the emission control valve set. (b) Disconnect the water bypass hose No. 3. (c) Disconnect the water bypass hose No. 2. (j) Using a socket hexagon wrench 8, remove the 4 bolts. (k) Remove the 2 nuts, emission control valve bracket and intake air surge tank. (l) Remove the gasket from the intake air surge tank. (a) Remove the nut and disconnect the ground cable. (b) Disconnect the 6 fuel injector connectors. (c) Uniformly loosen and remove the 9 bolts and 2 nuts in the sequence shown in the illustration. Remove the intake manifold. (a) Using a precision straight edge and feeler gauge, measure the surface contacting the cylinder head and intake air surge tank for warpage. (e) Lock the hose clamp as shown in the illustration and remove the water outlet together with the water bypass hose No. 1. (b) Remove the bolt, nut and insulator No. 3. (c) Remove the 2 bolts and insulator No. 2. (d) Uniformly loosen and remove the 7 nuts in the sequence shown in the illustration. (e) Remove the converter and gasket. (f) Remove the 2 bolts and manifold stay. (a) Remove the 3 bolts and pump bracket. (a) Remove the oil pressure switch. (a) Remove the 2 nuts and 2 sensors. 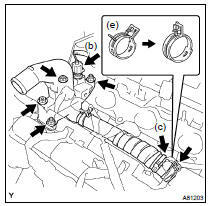 (a) Install the 2 knock sensors with the 2 nuts, as shown in the illustration. (a) Clean the threads of the oil pressure switch. Apply adhesive to 2 or 3 threads of the oil pressure switch. Adhesive: Part No. 08833-00080 THREE BOND 1344, LOCTITE 242 or equivalent (b) Install the oil pressure switch. 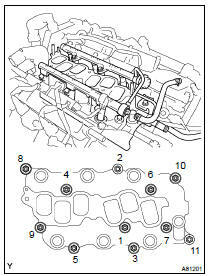 (a) Install the manifold stay with the 2 bolts, as shown in the illustration. (b) Install a new gasket and the converter sub-assy No. 2 with the 7 nuts. Uniformly, tighten the 7 nuts in the sequence shown in the illustration. Torque: 49 NVm (500 kgfVcm, 36 ftVlbf) (c) Retighten nuts 1 and 2 as shown in the illustration. (d) Install the insulator No. 2 with the bolt and nut, as shown in the illustration. (e) Install the insulator No. 3 with the bolt and nut, as shown in the illustration. Torque: 9.0 NVm (92 kgfVcm, 80 in.Vlbf) (f) Connect the A/F sensor connector. (b) Install the water outlet together with the water bypass hose No. 1 and unlock the hose clamp. (e) Connect the engine coolant temperature sensor connector. (a) Install the intake manifold with the 9 bolts, 2 nuts and 2 washers. Uniformly tighten the bolts and nuts in the sequence shown in the illustration. Torque: 15 NVm (153 kgfVcm, 11 ftVlbf) (b) Retighten the water outlet mounting bolts and nuts. 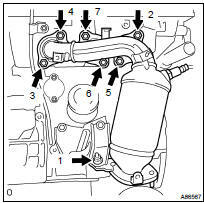 Torque: 8.0 NVm (82 kgfVcm, 71 in.Vlbf) (d) Connect the heater inlet water hose. (b) Install the intake air surge tank and emission control valve bracket with the 2 nuts. Torque: 28 NVm (286 kgfVcm, 21 ftVlbf) (c) Using a socket hexagon wrench 8, tighten the 4 bolts. (d) Install the surge tank stay No. 2 with the 2 bolts. Torque: 20 NVm (204 kgfVcm, 15 ftVlbf) (e) Install the surge tank stay No. 1 with the 2 bolts. Torque: 20 NVm (204 kgfVcm, 15 ftVlbf) (f) Install the engine hanger No. 1 with the 2 bolts. (g) Install the pressure feed tube with the 3 nuts. (h) Connect the ventilation hose. (i) Connect the union to the check valve hose. (j) Connect the water bypass hose No. 2. (k) Connect the water bypass hose No. 3. (l) Connect the throttle motor connector. (a) Install the emission control valve set with the 2 nuts. Torque: 8.0 NVm (82 kgfVcm, 71 in.Vlbf) (b) Install the clamp. (c) Connect the 2 vacuum hoses. 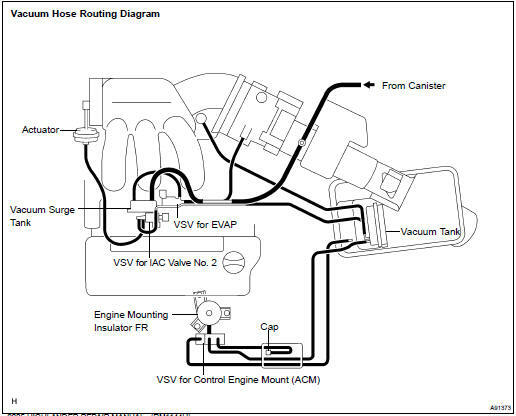 (d) Connect the fuel vapor feed hose No. 2. (e) Connect the fuel vapor feed hose No. 1. (g) Connect the 2 VSV connectors. (a) Install the engine mounting insulator RH and LH with the 2 nuts. (b) Install the engine mounting insulator FR with the nut. (c) Install the engine mounting insulator RR with the 2 bolts. (a) Install the vane pump with the 2 bolts. HINT: After adjusting the V-ribbed belt, tighten bolt A. (a) Install a new gasket and the exhaust manifold RH. Uniformly tighten the 6 nuts in the sequence shown in the illustration. Torque: 49 NVm (500 kgfVcm, 36 ftVlbf) (b) Retighten nuts 1 and 2 shown in the illustration. (c) Install the insulator with the 3 bolts, as shown in the illustration. Torque: 9.0 NVm (92 kgfVcm, 80 in.Vlbf) (d) Connect the A/F sensor connector. (a) Set the engine assembly with transaxle on the engine lifter. (b) Install the engine assembly to the vehicle. (c) Install the frame side rail plate RH and LH with the 6 bolts and 2 nuts. (d) Install the front suspension member brace rear RH and LH with the 6 bolts and 2 nuts. (a) Align the matchmarks on the intermediate shaft and the control valve shaft, and install the bolt. (b) Tighten the sliding yoke bolt. SST 09213-54015 (91651-60855), 09330-00021 (b) Using kerosene or gasoline, clean the bolts thoroughly. (d) Install the 6 torque converter set bolts. NOTICE: First tighten the green colored bolt and then tighten the 5 bolts. (e) Install the flywheel housing under cover with the 2 bolts. (a) Install the drive shaft to the steering knuckle. (b) Install the suspension lower arm with the bolt and 2 nuts. (a) Connect the tie rod end to the steering knuckle and install a new castle nut. Prevent any lubricant from contacting the thread and the taper portions. After tightening the castle nut, tighten it to the additional direction within 60 to put into a cotter pin. (b) Insert a new cotter pin. (a) Using a 30 mm socket wrench, install a new hub nut. Torque: 294 NVm (2,998 kgfVcm, 217 ftVlbf) (b) Using a chisel and hammer, tap the front axle hub LH nut. (a) Using a 6 mm socket hexagon wrench, hold the ball stud and install the nut. (a) Push in the fuel tube connector to the fuel pipe until connector makes a "click" sound. Check for damage or contamination on the connected part of the pipe. (b) Install the fuel pipe clamp. (a) Install the mounting stay and mounting bracket with the bolt. (a) Install the adjusting bar with the 2 bolts and 2 nuts.